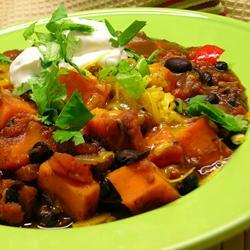 Place all ingredients except for the cheese and garnishes in a large pot. Cover and bring to a boil. Uncover and simmer until pasta is done, about 15 minutes. Stir in cheese, add more on top if you like. 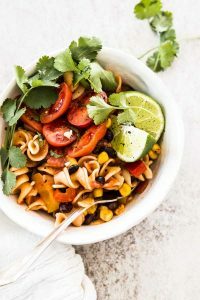 Serve with cilantro, diced tomatoes and lime wedges. Next, add in the mushrooms, the rest of the beans, broccoli, garlic, onion, Worcestershire and steak seasoning. Adjust oven rack to center position and preheat oven to 350°F. 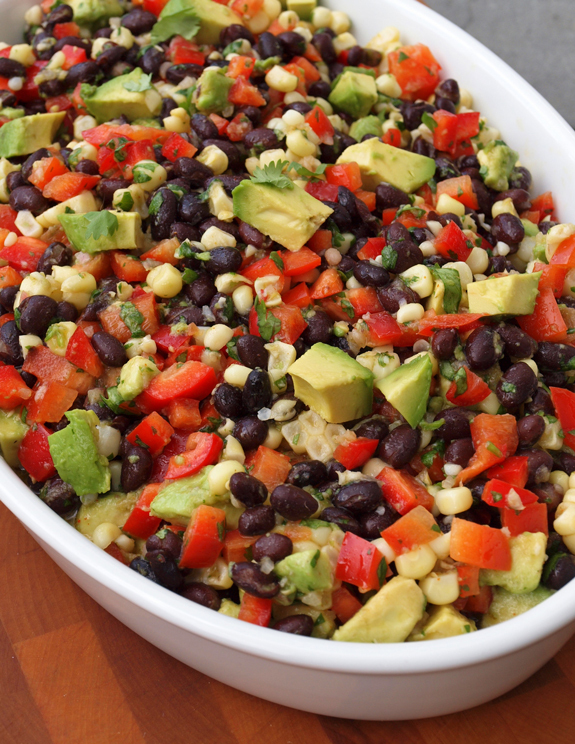 Spread black beans in a single layer on a foil-lined rimmed baking sheet. Place in oven and roast until beans are mostly split open and outer skins are beginning to get crunchy, about 20 minutes. Remove from oven and allow to cool slightly. While beans roast, heat 2 tablespoons oil in a medium skillet over medium-high heat until shimmering. Add onion and poblano and cook, stirring frequently, until softened, about 5 minutes. Add garlic and cook, stirring constantly, until fragrant, about 2 minutes. Add chipotle chili and sauce and cook, stirring, until fragrant, about 30 seconds. Transfer mixture to a large bowl. Place cashews in the bowl of a food processor and pulse until chopped into pieces no larger than 1/3-inch, about 12 short pulses. Add to bowl with onions and peppers. When beans are slightly cooled, transfer to food processor. Add cheese. Pulse until beans are roughly chopped (the largest pieces should be about 1/3 of a full bean in size). Transfer to bowl with onion/pepper mixture. Add mayonnaise, egg, and bread crumbs and season with salt and pepper. Fold together gently but thoroughly with hands. Patty mixture can be stored in an airtight container in the refrigerator for up to three days at this stage. 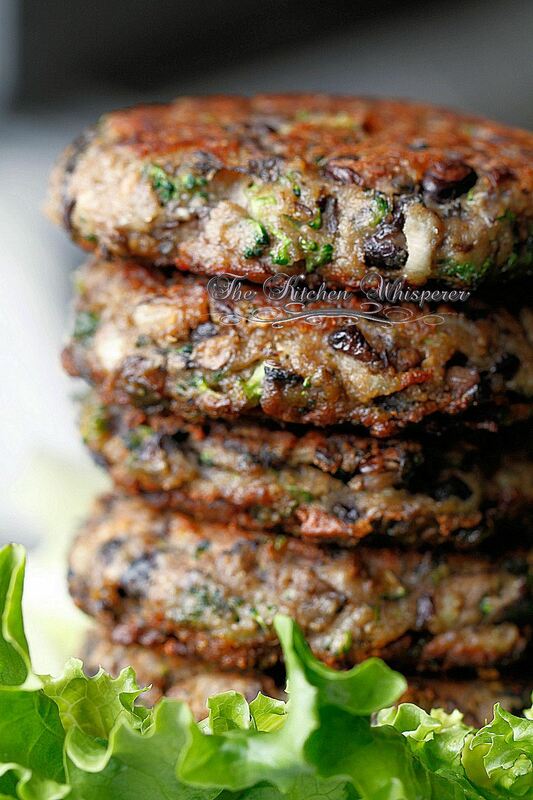 To cook indoors: Form bean mixture into 6 to 8 patties as wide as your burger buns. Heat 1 tablespoon oil in a large non-stick or cast iron skillet over medium heat until shimmering. Add 4 patties and cook, swirling pan occasionally, until well browned and crisp on first side, about 5 minutes. Carefully flip and cook until second side is browned, about 5 minutes longer, adding cheese if desired. If cooking more than 4 burgers, cook in batches, keeping cooked burgers on a rack set in a rimmed baking sheet in a 200°F oven while second batch cooks. Spread top and bottom buns with chipotle mayonnaise or other condiments as desired. Add toppings to top or bottom bun as desired. 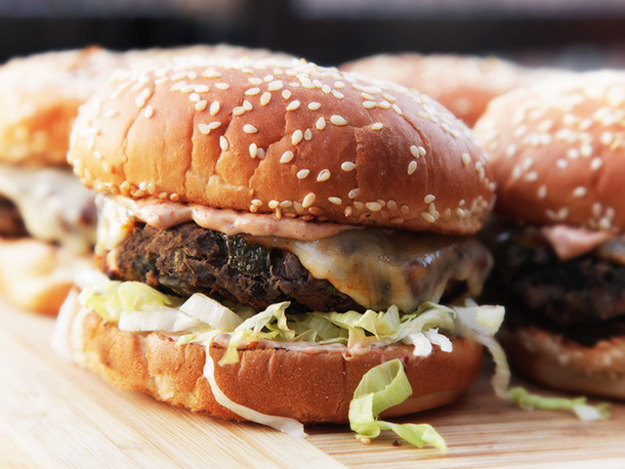 Place patties on bottom buns, close burgers, and serve immediately. Preheat oven to 400 degrees F (200 degrees C). Line a baking sheet with parchment paper or a silicone baking mat.Combine sweet potatoes, chipotle pepper, 1/2 teaspoon salt, and 1 tablespoon olive oil in a large bowl and toss to coat. Spread sweet potatoes on the prepared baking sheet in a single layer.Roast sweet potatoes in the preheated oven until the outside is crunchy and inside is tender, 20 to 25 minutes. 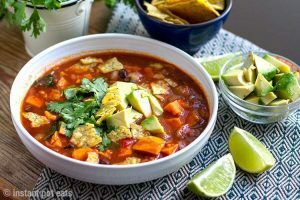 Allow to cool to room temperature.Cook and stir remaining 1 tablespoon olive oil, onion, garlic, red bell pepper, jalapeno pepper, ancho chile powder, cumin, and dried oregano together in a large pot or Dutch oven over medium heat. Cook and stir until onion is softened, about 5 minutes.Pour tomatoes and water into the onion mixture and bring to a simmer. Add cornmeal, 1 teaspoon salt, sugar, and cocoa powder. Bring to a simmer, stirring constantly, reduce heat to low and simmer for 30 minutesStir black beans and cooled sweet potatoes into the onion-tomato mixture. Add more water if mixture is too thick. Simmer until heated through, about 15 minutes. Season with salt and cayenne pepper to taste. Serve topped with sour cream and cilantro. 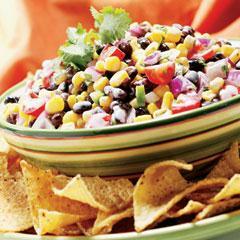 In a bowl, toss the beans and corn with the cilantro lime dressing. Peel and pit the avocados and cut into wedges or cubes. Arrange the salad greens on individual serving plates and mound the bean and corn salad in the center. Top with avocado and ring the salad with chips. If you wish, top with sour cream or grated cheese. Whisk together all ingredient in a bowl. Or for a bright green, smooth dressing, in a blender on low speed, whirl the cilantro, scallions, lime juice, salt and red pepper until smooth. Add the olive oil in a steady street and as soon as it thickens, turn off the blender. Combine Hellmann’s mayo, lime juice and cumin in medium bowl. Stir in remaining ingredients. Serve chilled or at room temperature. Stir corn, black beans and tomato into the saucepan, and continue to simmer about 5 minutes until heated through. Mix in the black beans and cilantro. Serve as taco filling on corn tortillas embellish with salsa, cheese, sour cream and avocado. For those who want to love quinoa more than they do, incorporating quinoa into a soup or stew is one way to avoid its stick-in-your-teeth seediness. 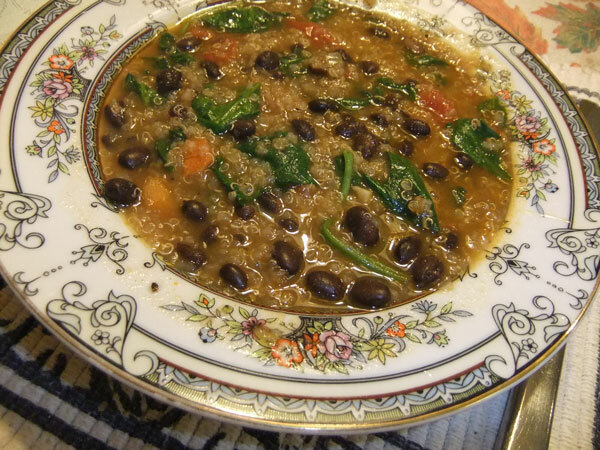 Here, it bulks up a simple black bean soup, providing the starch (and extra protein) to make a hearty meal. Increase the heat to medium-high and bring the liquid to a boil, then reduce the heat to low so the mixture is barely bubbling around the edges. 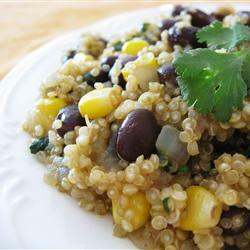 Cover, and cook until the quinoa has swelled and is tender, 20 minutes. Stir in the spinach leaves and cook just until they are wilted, a few minutes. Transfer to a bowl and eat. 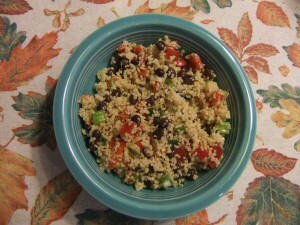 Bring veggie broth to a boil in a 2 quart or larger sauce pan and stir in the couscous. Cover the pot and remove from heat. Let stand for 5 minutes. In a large bowl, whisk together the olive oil, lime juice, vinegar and cumin. Add onions, garlic, red pepper, cilantro, carrots, tomatoes and beans and toss to coat.